Enquiries we carry an extensive stock of beautiful jewellery in a range of precious metals to suit the most discerning customer, but in the event we don’t have what you are seeking in our showroom, we will endeavour to source it from our extensive list of contacts. Made to Order we can make up many of our stock pieces in your choice of precious metal set with other diamond sizes and gemstone combinations. 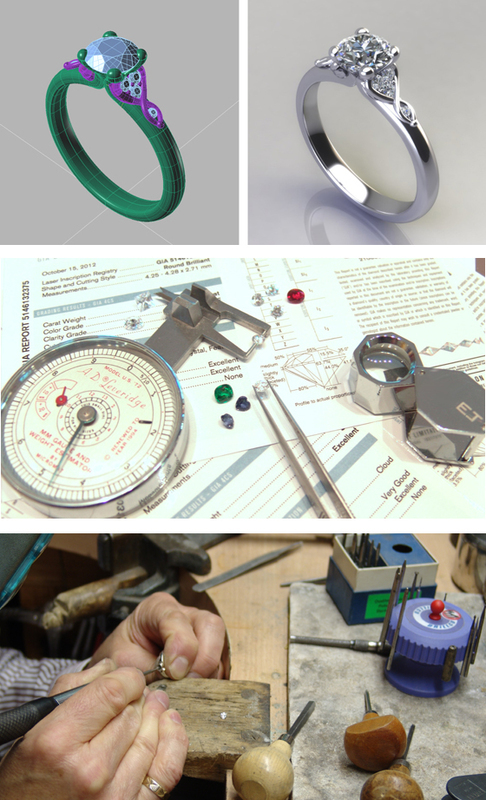 Bespoke Design and Commissions you take part in the design process, which customers tell us they thoroughly enjoy. As design specialists we combine high quality traditional craftsmanship with the latest CAD CAM technologies so you can view your new design in amazing photo real 3D before we turn your ideas and dreams into the real beautiful piece of jewellery. More info..
Remodelling and Redesign of items out of style or never worn; a very economic solution. More info.. Melt and make service – melting your old/sentimental precious metal to make new jewellery. More info..
Part exchange your old and worn out jewellery against a new item. More info..
Remounting and Restorations including the re-polishing of damaged and worn Diamonds and Gemstones. More info.. Careful Matching and Replacement of missing Diamonds and Gemstones More info..
All types of Jewellery Repairs combining high quality traditional craftsmanship with the latest cutting edge laser technologies enabling us to carry out repairs previously considered uneconomic. More info..
Diamond Grading and Gem-Testing More info..
Watch Repairs on most makes, mechanical, automatic and quartz movements. More info..
Watch batteries, straps and bracelet replacements + watch bracelet adjustment service to most brands. Insurance Replacement and Repair Quotations and the subsequent replacement/restoration of lost, stolen and damaged items. More info.. Valuations for Insurance, Probate, Sale between Parties More info..